"The following content is from www.kawasakiz1.com and is reproduced with the permission of Paul Mercer. All photographs are subject to copyright of the respective owners who are mentioned on Paul's website." 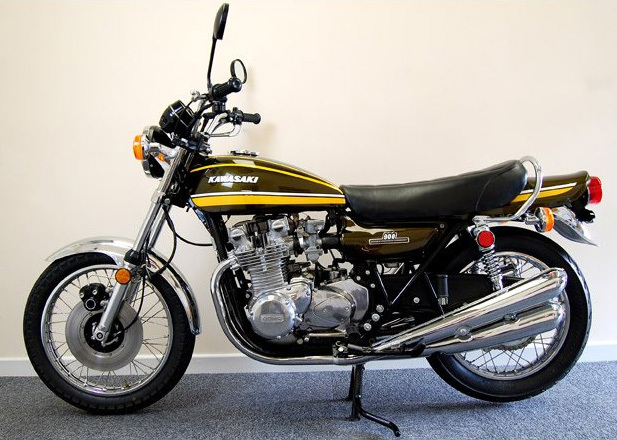 The 1974 model Kawasaki Z1A was actually first produced in August of 1973. The styling of the Z1A was basically the same as the original Z1, however there were several important changes. The most obvious change was the fact that the engine was no longer painted in black. It was now produced in a bare aluminium finish. This was partly due to the fact that the black painted engines on the Z1 was not very durable in some climates. Some enthusiasts preferred the new look, whilst others preferred the black finish of the earlier Z1 engine. Candy Tone Green / Yellow and Candy Tone Brown / Orange. Kawasaki now listed the base colour first and the colour of the broader stripes was listed as the secondary colour. The base colours were similar to those of the Z1, however, instead of the large coloured tank panels as on the Z1, there were now stripes on the fuel tank. The Candy Tone Green / Yellow version had a broad yellow stripe with a narrow white stripe above it along the lower half of the fuel tank. These stripes carried through to the tailpiece, but unlike the Z1, they did not curve upwards or go over the top of the tailpiece. 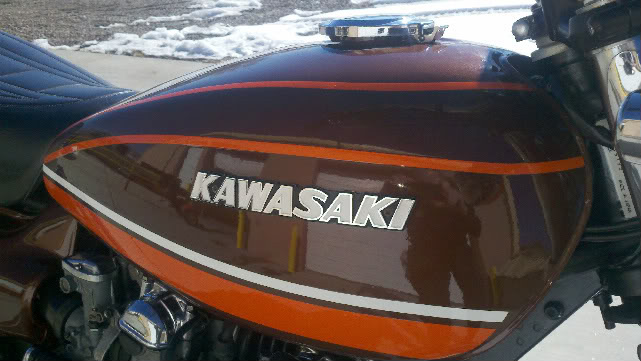 Above the KAWASAKI badge on each side of the fuel tank there were two more narrow yellow stripes. These stripes joined together at the rear of the tank and moved further apart towards the front of the tank. The KAWASAKI badges on the fuel tank were in the same style as the Z 1, however they were now 180mm long, although some early Z1As had the smaller badges fitted. In comparison to the Candy Tone Green / Yellow version, the Candy Tone Brown / Orange version had orange stripes in place of yellow stripes. The white stripes were the same on both colour schemes. The side panels were in the relevant base colour. The '900 DOUBLE OVERHEAD CAMSHAFT' badges were in the same style as the Z1. The alternator cover on the left side of the engine now had the legend DOHC in silver lettering with a mottled silver background. The ignition points cover on the right side of the engine was still finished in polished alloy and still had the legend DOHC in silver lettering with a black background. As with the Z1, the large clutch plate cover on the right hand side was also finished in polished alloy, as were the top half only of the camshaft end caps and the top covers and float bowls from the carburettors. Visually, the frame, suspension components, brakes, wheels and tyres remained similar to the Z1. There were some minor changes though. For example, the drive chain adjusters were now 10mm bolts instead of the original 8mm bolts on the Z1. The drive chain lubrication system that had been fitted to the Z1 was modified to be more efficient. The five speed gearbox remained. The 1-N-2-3-4-5 gear change pattern was now embossed on the chain case just near the gear lever. As with the Z1, the riders footrests on US models were of the folding type and the UK models were still fixed. The instruments were similar to the earlier Z1, however, the descriptor wording was now below each lamp and changed from FLASH to TURN, NEUT to NEUTRAL and BEAM to HIGH BEAM. OIL remained as OIL. They now showed, from left to right, TURN (orange), NEUTRAL (green), HIGH BEAM (blue) and OIL (red). The word 'IGNITION' was also shown on the console in a semi-circular pattern below the ignition barrel. A 'STOP LAMP' failure warning light now featured within the tachometer. This would light up when the brake was applied but would flash if the stop lamp bulb had failed. Some early Z1A's did not have this feature.